A review in 10 words (or thereabouts): A gentle giant, a giant war. Goliath of Gath isn’t much of a fighter. Given half a choice, he would pick admin work over patrolling in a heartbeat, to say nothing of his distaste for engaging in combat. Nonetheless, at the behest of the king, he finds himself issuing a twice-daily challenge to the Israelites: “Choose a man. Let him come to me that we may fight. If he be able to kill me then we shall be your servants. But if I kill him, then you shall be our servants.” Day after day he reluctantly repeats his speech, and the isolation of this duty gives him the chance to banter with his shield-bearer and reflect on the beauty of his surroundings. This is the story of David and Goliath as seen from Goliath’s side of the Valley of Elah. What a beautiful and sad graphic novel! 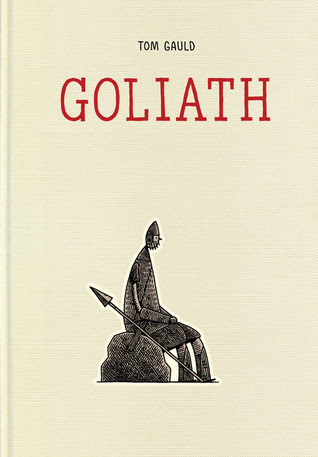 Goliath might have been big and intimidating, but his heart was gentle . He had no aspirations of being a great war hero. But all the sudden he finds himself as the face for "the end" of the war. Sent out each day to basically antagonize the enemy, Goliath learns to love the solitude and beauty of the land. He wasn't a warrior. He wasn't a killer. And in one swift move, he was no more. The art is clear and simple. The dialogue equally so. And the sparsity of the story makes it all the more emotional and interesting. A definite must read.